A morning crane collapse shook lower Manhattan on Friday, Feb. 5, 2016. Wind and snow has been soaring in the New York sky at speeds in excess of 40 miles per hour this week. The crane was operating at a construction site on Worth Street in Tribeca, just steps from the Thomas Street Supreme Courthouse. It rose 600 feet into the air, where wind conditions are far more turbulent than on the Earth’s surface. When construction workers realized the danger posed by the high winds, they quickly cleared the sidewalks of pedestrians. The operator of the giant machine did his best to secure the boom and mast to prevent a crane accident. However, the continuous wind gusts overtook the crane, tilting it into a fall downward. Fortunately the crane operator was able to direct the boom away from surrounding buildings occupied by hundreds of people. The 60 story crane collapsed along Worth Street, taking out two City blocks. The crane accident crushed a row of half a dozen cars parked the street, one of which was occupied by David Wichs, who was killed while seated in his car. At least 3 other people were also seriously injured. If the falling crane had struck a building, mass casualties would be expected. Hurt in a Crane Accident at a New York construction site? Apart from recognizing the crane operator for steering the crane away from the buildings, the reason for the crane’s loss of balance must be investigated. Preliminary review of video footage shows the crane’s luffer arm was angled out into the wind. 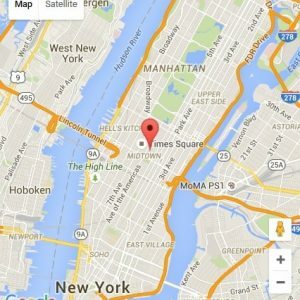 New York City’s Department of Buildings is reviewing the crane’s on board computer and prior inspection records to determine how the accident could have been prevented. The collapsed crane is owned by Bay Crane, headquartered in Hicksville, Long Island. At the time of the collapse, it was operated by Kevin Reilly, who has declined public comment. The crane operator’s cab flipped over in the middle of Worth Street, and its extended caterpillar wheels took out a nearby sedan. The crane operator survived the flip over and is cooperating with the investigation. Hurt in a Crane Accident? We have a proven track record establishing the liability of construction companies in large scale crane collapse and construction site injury cases. Call our crane accident lawyers for a free consultation in Manhattan, Brooklyn, Queens & the Bronx, NYC. This kind of accident is so scary and seems to happen too often! What can we do to impose stricter safety requirements of these construction companies so that these kinds of accidents can be prevented in the future? ?